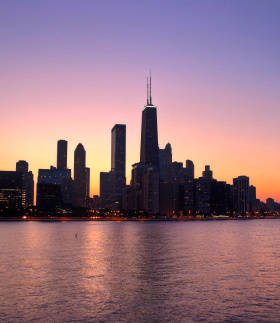 The City of Chicago covers an area of 148,000 acres and sits 578 feet above sea level on the southwestern shore of Lake Michigan – the 5th largest body of fresh water in the world. The city is traversed by the Chicago and Calumet rivers. Chicago’s extensive parklands, including 3,000 hectares of city parks attract an estimated 86 million visitors annually. Chicago is recognized across the United States as a very passionate sports town. Chicago is a leader in reforming public schools, enhancing public safety and security initiatives, providing affordable housing in attractive and economically sound communities, ensuring accessibility for all and fostering, social, economic and environmental sustainability. You can zoom the map in or out using the +/- boxes in the left corner to find nearby suburbs. You can also put the cursor over the map and left-click to slide the range of the map, or click “View Larger Map” at the bottom to see an expanded view of of the Chicago metropolitan area.